Michael Hoomanawanui legally caught this third-quarter pass despite lining up as the left tackle on the play. OK, let’s try to explain that crazy receiver-ineligible formation from Saturday’s win over the Ravens as simply as possible. And how Bill Belichick just may have unlocked the door to a wild new offense with infinite possibilities. ■ On each play, an offense is required to have seven players line up directly on the line of scrimmage, and four behind it. The quarterback is one of those four, and the others are usually running backs, fullbacks, tight ends, and slot receivers. ■ Six of the 11 players on offense are eligible receivers and can catch a forward pass. The other five are ineligible receivers. They cannot catch a forward pass or head downfield before the ball. But they can receive and advance a lateral. This is important. ■ Of the seven players on the line of scrimmage, only the two on either end are eligible receivers. The inside players are all ineligible. This is also important. ■ Players at positions that are typically eligible (quarterback, running back, fullback, receiver, tight end) wear Nos. 1-49 and 80-89. Players at positions that are typically ineligible (offensive line) wear Nos. 50-79. Players are free to report as eligible, and vice versa. They just need to report to the referee before each play. A player is free to report as eligible/ineligible on consecutive plays, but they need to inform the referee each time. Once a player changes his eligibility, he only returns to his original eligibility if he sits out a play or after a timeout, end of a quarter, after a penalty, and so on. Right guard Josh Kline left the field. Nate Solder is now the left guard and Michael Hoomanawanui the left tackle. 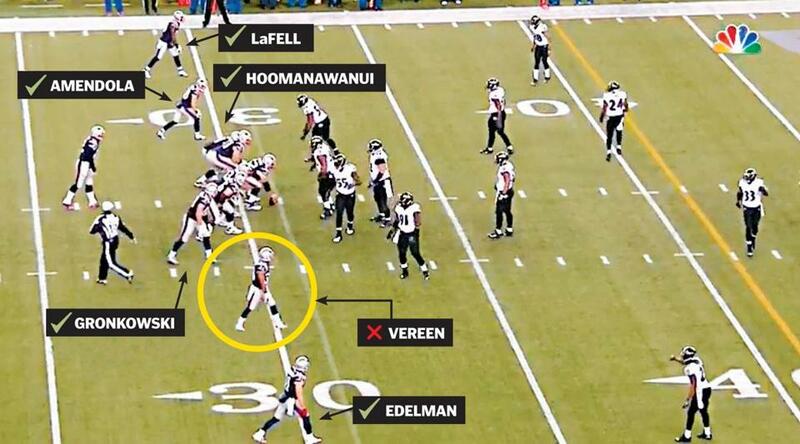 Here’s our weekly look at the key plays in the Patriots’ game after reviewing the film. The Patriots used this tactic three times in the third quarter in the middle of a drive. They pulled right guard Josh Kline from the game, lined up Nate Solder at left guard, Michael Hoomanawanui at left tackle, and inserted a skill player as ineligible. The Patriots have six offensive skill players in the game (excluding QB Tom Brady), but only five can be eligible receivers. By rule, the three players off the line of scrimmage — Brandon LaFell, Danny Amendola, and Rob Gronkowski — are eligible receivers, and Julian Edelman and Hoomanawanui are both eligible because they are the outside players standing on the line of scrimmage. Shane Vereen is ineligible because he’s on the inside of the line of scrimmage. The first time, Shane Vereen was ineligible. He was lined up in the right slot, but on the line of scrimmage. Standing to his right was Julian Edelman, also on the line of scrimmage. Vereen was considered an “inside” player and therefore not eligible. Hoomanawanui is eligible to streak down the field for the pass, even though he lined up at the left tackle position. Vereen, meanwhile, cannot go downfield, or else he’ll be penalized as an ineligible receiver. On the left side of the formation were Danny Amendola and Brandon LaFell, both lined up off the line of scrimmage. That made Hoomanawanui the “outside” player on the left, making him eligible, even though he lined up at tackle. The Ravens have no idea what hit them, and Hoomanawanui gets a nice 16-yard gain. 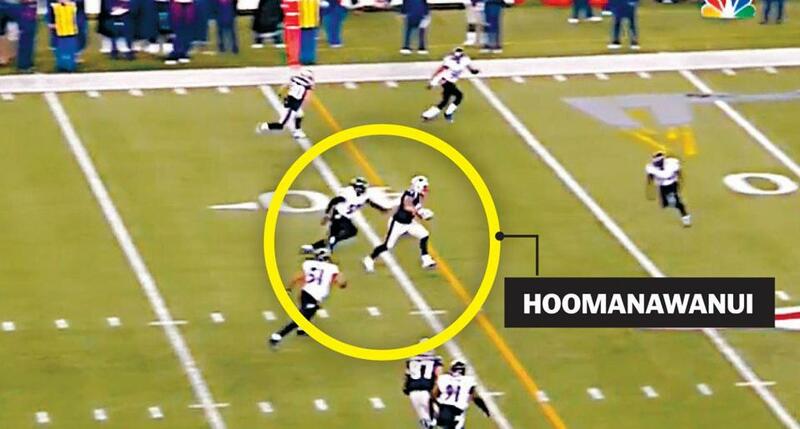 The Ravens had no idea what was going on, and Tom Brady found Hoomanawanui for 16 yards. Two plays later Brady hit Edelman for 11 yards, and two plays after that went back to Hoomanawanui for 14 yards before John Harbaugh finally threw a fit and drew an unsportsmanlike conduct penalty. 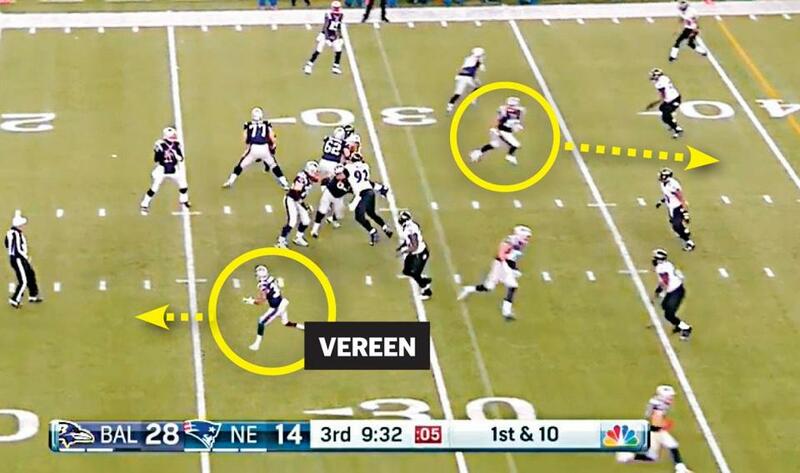 The first two times the Patriots used the tactic, Vereen and Hoomanawanui, came off the field on the following play. The third time, a penalty allowed Vereen to stay on the field for the next play. Future Patriots opponents will be wary of this formation, but it’s such an intriguing concept that we’d love to see an innovative coach such as Belichick or Chip Kelly continue to develop off it. Even though Vereen was ineligible, the defense can’t just leave him wide open, because he can receive and advance a lateral. Take this to the extreme, and an offense could trot nine skill players onto the field, make three of them ineligible, but run an option-based offense with myriad passing and lateral opportunities. At minimum, an offense can create speed and blocking advantages with untraditional formations. The possibilities are endless, if the oft-conservative NFL got a little adventurous. Anyway, it was a brilliant tactic, and proved once again why Belichick is the greatest coach of his generation. ■ Let’s start with Brady, because the Patriots put the entire game on his shoulders (they had seven true rushing attempts, the last of which came with 1:13 left in the second quarter). And Brady was a maestro, carving up the Ravens’ secondary and making the right read time and time again. The Ravens played mostly man coverage but also plenty of two-deep zone to keep the Patriots on their toes. ■ I don’t know if the Patriots’ game plan was to slowly pick the Ravens apart with short passes, but Brady did a great job of taking what was given to him. The Ravens’ defensive backs gave the Patriots’ receivers huge cushions at the line of scrimmage, and Brady just dinked-and-dunked them to death with short throws and yards after the catch. Thirty-two of Brady’s 50 pass attempts traveled fewer than 10 yards in the air, and he completed 26 of them for 219 yards and a touchdown — death by a thousand paper cuts. And when the Ravens gave away their blitz intentions along the goal line, he flashed a quick hand signal to Rob Gronkowski and hit him on an easy slant for a 5-yard touchdown against safety Will Hill. Too easy. ■ Brady also did a great job of spinning away from pressure — slipping out of the grasp of both Terrell Suggs and Elvis Dumervil and buying enough time to throw the ball away. Brady’s improvement in avoiding the rush and extending the play is by far his most impressive attribute of the season. ■ Underrated play for Brady: Third and 8 in the first quarter, Patriots trailing, 14-0, he corrals a high snap, avoids the pass rush, and hits Gronkowski for a big first down. ■ It wasn’t all perfect, of course. Brady took two sacks in the second quarter to knock the Patriots out of field goal range, one of which was definitely on Brady to get the ball out quicker. And even though Ravens linebacker Daryl Smith was in man coverage, not Tampa 2, Brady didn’t expect Smith to turn his head and look for a pass over the middle that resulted in an easy interception at the end of the first half. ■ Poor Rashaan Melvin, an undrafted free agent out of Northern Illinois in 2013 who bounced between Tampa Bay and Miami’s practice squad before an injury-depleted Baltimore team signed him to the active roster in November and inserted him as a starting cornerback. Melvin consistently played 8 yards off the line of scrimmage to prevent from getting burned, but Brady attacked him underneath all day. The Patriots threw at Melvin 15 times, completing 12 of those passes for 196 yards and two touchdowns. Melvin bit badly on the Edelman-to-Amendola 51-yard touchdown pass, and the one time Melvin played press coverage, LaFell beat him for the winning 23-yard touchdown. The Patriots targeted Melvin eight times in the second half, completing seven passes for 111 yards and two touchdowns. ■ The offensive line deserves special recognition because they kept Brady clean on a day he dropped back to pass 53 times and everyone in the building knew the Patriots weren’t going to run. Sebastian Vollmer did a great job in washing out Dumervil, who didn’t register a single statistic, while Solder was excellent against Suggs, who had two tackles, a half-sack, and a pressure. Ryan Wendell did an admirable job switching to center after Bryan Stork’s knee injury, and kept Haloti Ngata and emerging star Brandon Williams in check. Brady’s quick passing helped a lot with the protection, but a great job by the guys up front handling the Ravens’ overloads and stunts. 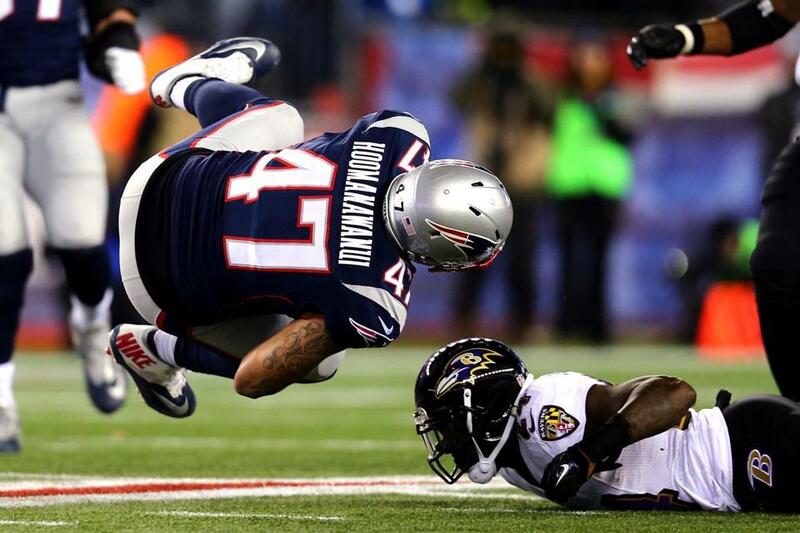 ■ Ravens safety and former first-round pick Matt Elam needs to work on his tackling. He whiffed on Brandon Bolden on the Patriots’ opening play, and again on Amendola’s touchdown. Melvin also whiffed on Amendola when the receiver did a great job of stretching for the first-down sticks. ■ The run blocking was ineffective on the few occasions they tried it — Stork, in particular, was blown 3 yards back on a rush attempt from the Ravens 1. Wendell got beaten badly by Timmy Jernigan for a sack late in the second quarter, and Solder got beaten a couple of times by Suggs around the edge. But overall, the offensive line had a championship effort. ■ Count me as someone who agreed with the Patriots’ clock management strategy at the end. A handoff or a pass was too risky, taking the safety would have cut their lead from 4 to 2, and even having Brady run around to milk some clock would have pinned the Patriots too close to their goal line for the punt situation, and leave Brady open for a big hit. Executing a punt and defending a Hail Mary seemed like the safest option. ■ The Ravens certainly dominated the Patriots’ front seven in the run game, with Justin Forsett averaging 5.4 yards per carry and showing great patience to let the blocks and running lanes develop. The Patriots had a terrible time getting off blocks — particularly Rob Ninkovich, Chandler Jones, Dont’a Hightower and Jamie Collins — and Vince Wilfork was getting pounded with consistent double teams and cut blocks. I imagine he was quite sore on Saturday night. Interestingly, many of Forsett’s big runs came between the tackles, and not on the outside stretch play. ■ The difference in the second half was the Patriots started run blitzing more — Hightower and Collins were both quite effective blitzing up the “A” gaps — and the Patriots got better contributions from the back end in run defense. Kyle Arrington made a fantastic play to shed his receiver and fill the lane to tackle Forsett after 2 yards, while Patrick Chung and Tavon Wilson made nice stops in the run game as well. ■ Not the best day for Darrelle Revis, but it wasn’t as bad as it seemed. The penalties were a wash — the pass interference looked like it could’ve gone either way, but he got away with one or two holding calls, too. The Ravens did a good job of creating separation for their receivers with legal picks and crossing routes. And you have to give credit to Steve Smith, who showed why he’s still an elite receiver at age 35. He did a great job of setting up Revis to run a corner route, then planted, cut inside while Revis had his hips turned the wrong way, and caught an easy slant pass for a touchdown. Revis was this close to recovering to make the play, and got a fingertip on the ball. And in the second half, Revis held Smith without a catch. ■ The Ravens used a healthy dose of play-action, but I was surprised they didn’t call more boot-action plays for Joe Flacco off the fake stretch run. But when they did, it was effective — the 19-yard touchdown pass to Kamar Aiken, a 16-yard pass to Mike Campanaro, and an 11-yard pass to Kyle Juszczyk on fourth and 1. 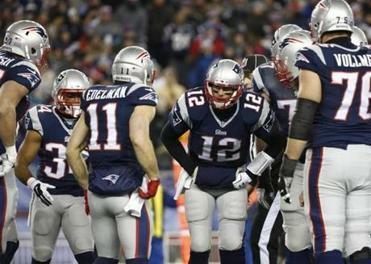 ■ The receiver-ineligible stuff wasn’t the only new formation the Patriots debuted. How about this personnel package on the Ravens’ final drive: Four linebackers (Jones, Ninkovich, Hightower, Collins) and seven defensive backs (Revis, Arrington, Logan Ryan, Devin McCourty, Chung, Wilson, Duron Harmon). Flacco rightly went after Ryan covering Torrey Smith, but didn’t see Harmon in deep center field and lofted a terrible pass off his back foot that Harmon easily intercepted in the end zone. ■ McCourty showed awesome anticipation in intercepting Flacco in the third quarter, reading Flacco’s eyes and running toward the spot of the ball before Flacco had released the pass.